Time to pull out all the spooky decorations and get ready for Halloween! 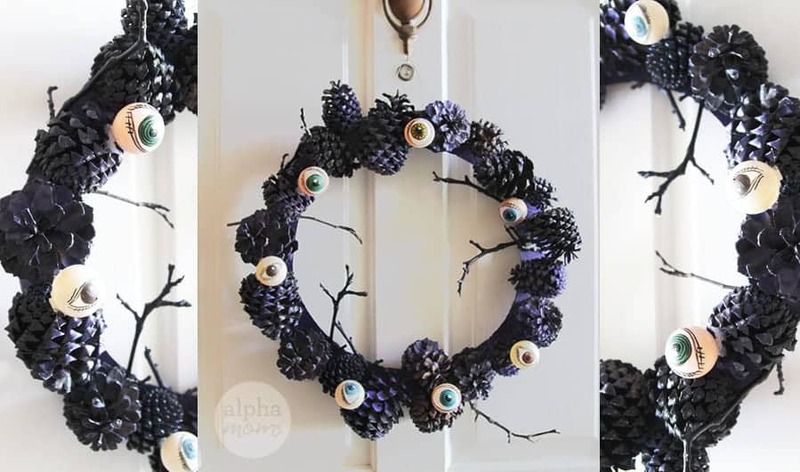 Last year, I made this really cool creepy wreath with pine cones, ping pong balls, sticks and cardboard. It turned out so great I made a point of bagging it up and saving in a safe place in the garage so I could bring it out again this year. It’s definitely a favorite in our holiday decoration collection. So I thought I’d share how I made it. 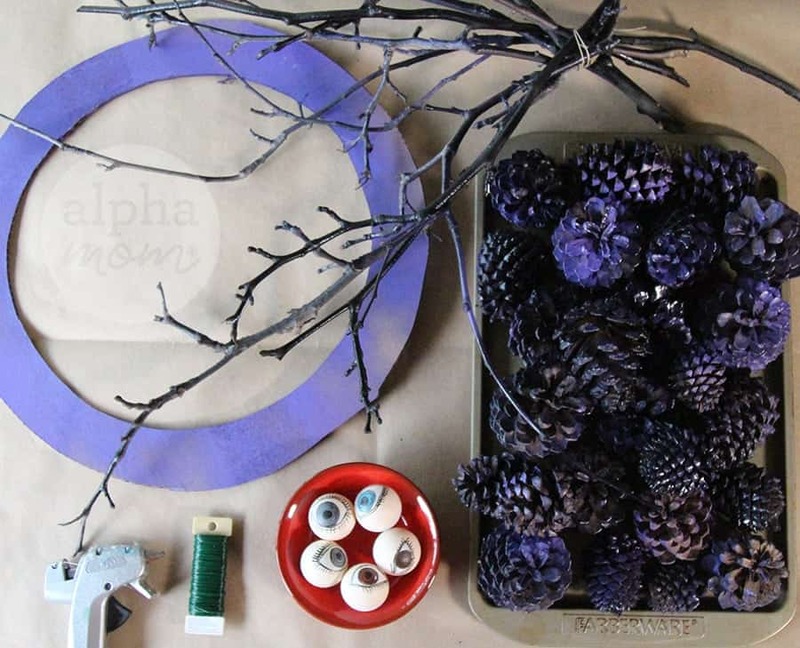 Step 1: First I spray-painted the pine cones purple. I did this outside in a box so the over-spray would stay contained. Then I spray-painted my cardboard ring to match and let everything dry for an hour or two. 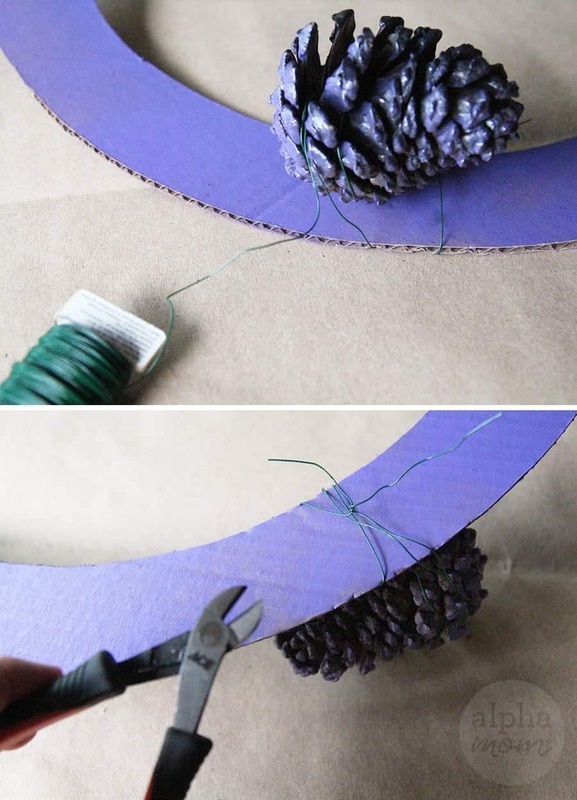 Step 2: Next I attached the pinecones to the cardboard ring by wrapping them with floral wire and tying them off in the back. Fill the ring all the way around this way and make sure everything is secure. 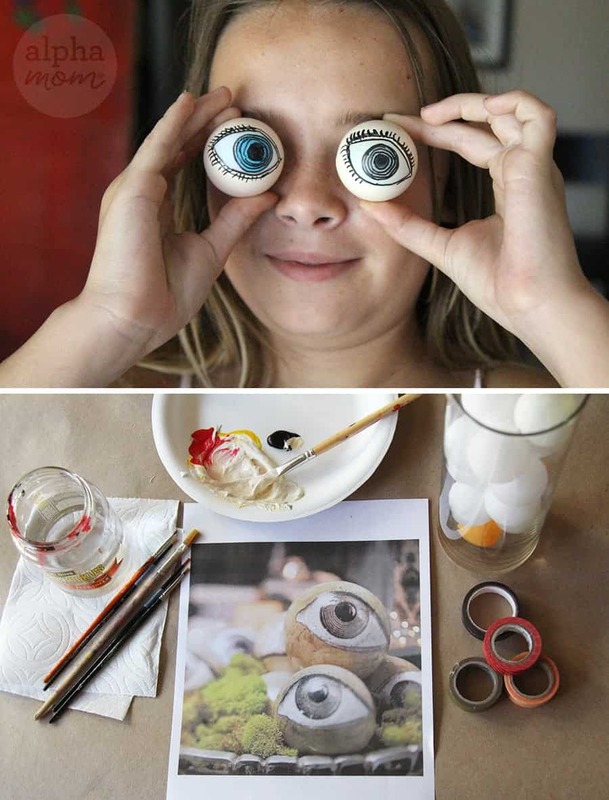 Step 3: Then I painted my ping pong balls to look like eyeballs. First I painted around the ping pong ball in a skin color paint (leaving the white of the eye, un-painted). 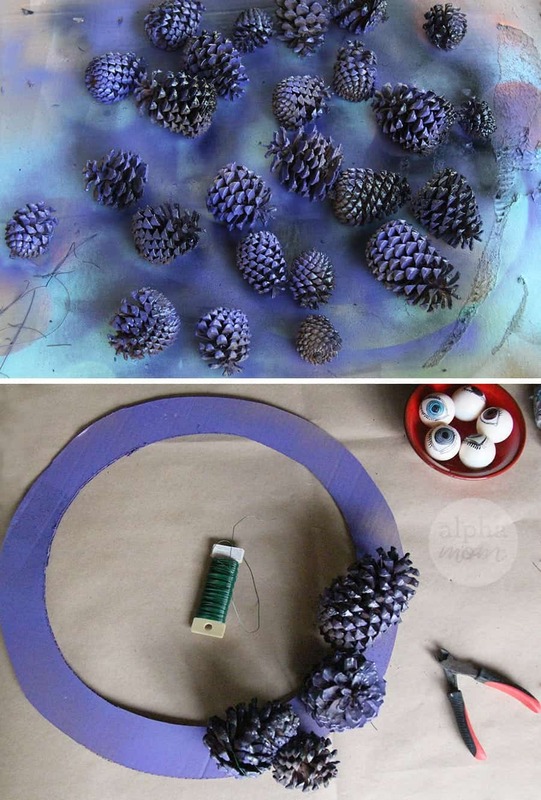 Then I painted a circle in the middle of the white area a pupil color and then a black iris on top of that. I let them dry completely (at least an hour) and then outlined the detail with a black permanent marker. As you can see I wasn’t super careful about my lines. I put some markings inside the iris for texture and then and an eyelid line on top and bottom and some eyelashes. Believe me, I thought I was doing a terrible job at the time but once I stepped back and looked at my work I kind of liked it! 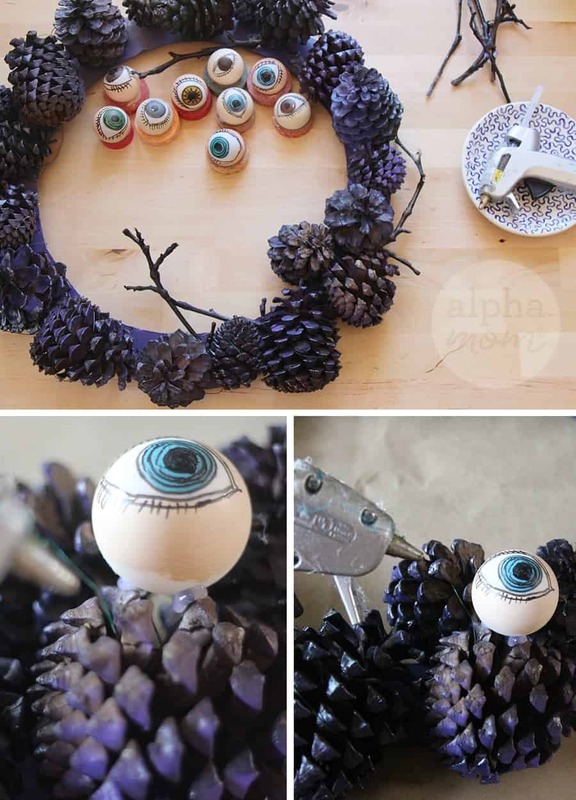 Step 4: Now it’s time to add the creepy ping pong ball eyes to your wreath. Hot glue is the easiest way to do this but if you have more time on your hands you could opt for normal white craft glue. It might be fun to add plastic spiders or even snakes too but I skipped that step because I didn’t feel like making another drive to the craft store. 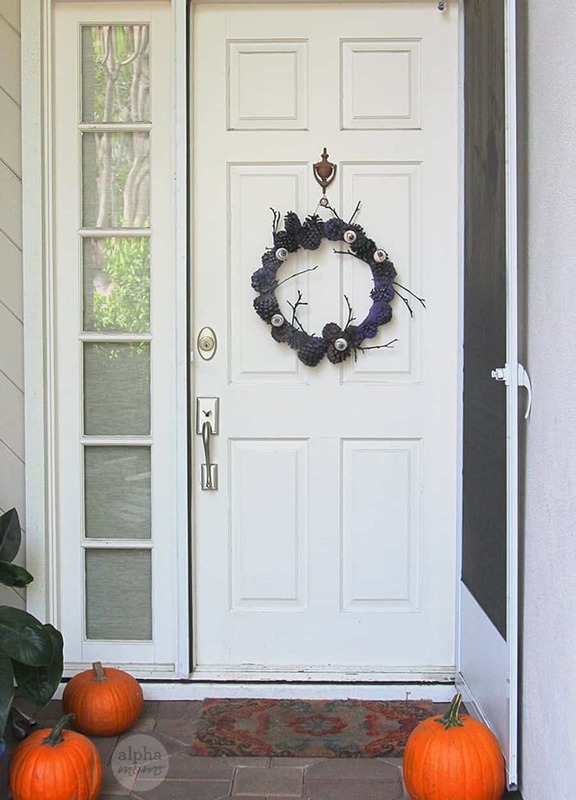 Then I hung it on my front door and now we wait for Halloween! I have a feeling this will bring all the trick or treaters to our door. 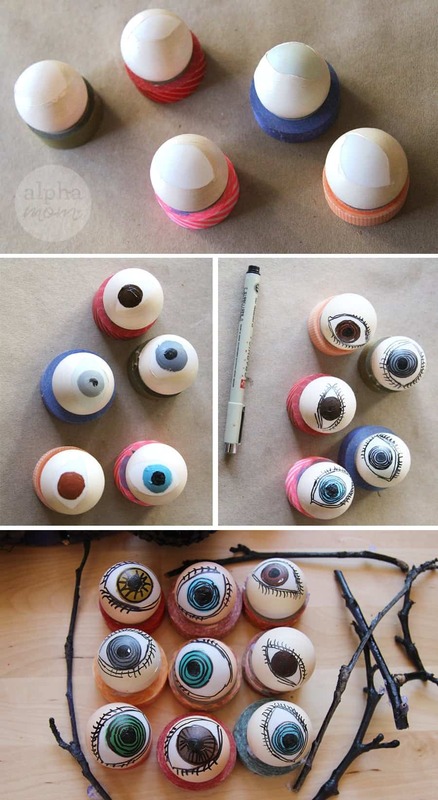 I think next year I’m going to make the eyeballs light up!